Cairo: The U.N. migration agency says recent clashes between rival Libyan militias for control of Tripoli have displaced more than 18,000 people. The fighting pits the Libyan National Army, led by commander Khalifa Haftar against militias affiliated with Tripoli's U.N.-backed government. The clashes threaten to re-ignite civil war such as the 2011 one that toppled and killed longtime dictator Muammar Gaddafi. Libya is split between rival governments in the east and west. The country slid into chaos after the 2011 uprising, in which rebels overthrew and killed longtime dictator Muammar Gaddafi and looted his vast arsenal. 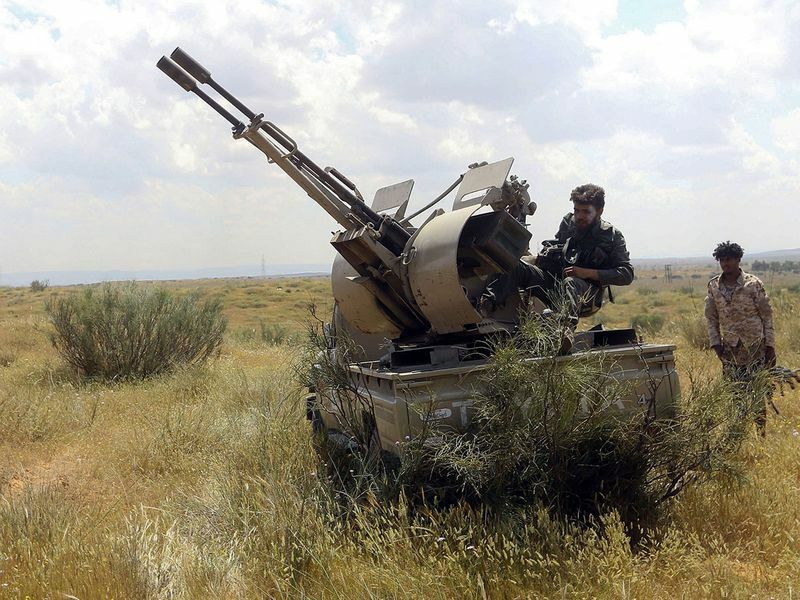 Even more weapons have flowed in since then, despite a U.N. arms embargo, as Arab states have backed local allies and Western nations have partnered with militias to combat extremists and stem the flow of migrants. A former general is now marching on the capital, Tripoli, where an array of militias — which have fought each other in the past — have for now joined forces to prevent a return to one-man rule. 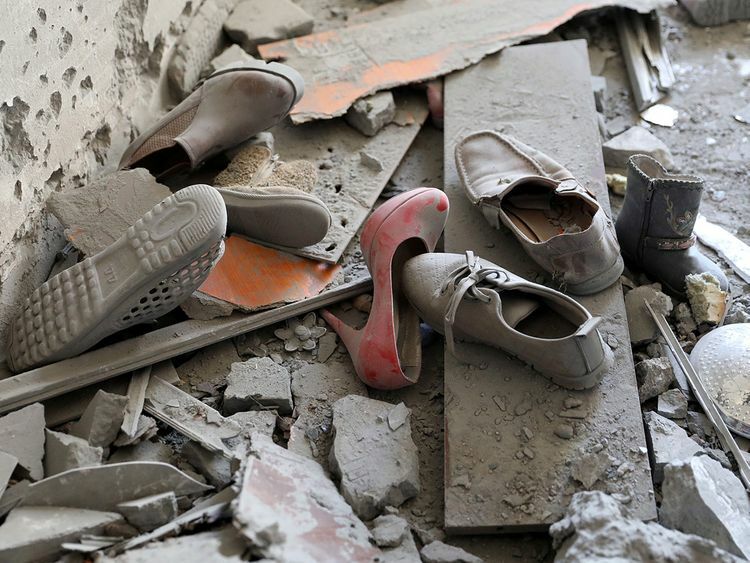 The fighting has already killed around 150 people, according to UN figures. The International Crisis Group, a Washington- and Brussels-based think tank, said last week that the two main coalitions "appear equally matched," with fighter jets, gunships and heavy artillery. The Libyan National Army, led by Field Marshal Khalifa Haftar, launched a surprise offensive to retake Tripoli on April 5. Haftar's opponents view him as an aspiring dictator, and one of his commanders is wanted by the International Criminal Court for war crimes, accused of dozens of extrajudicial killings. Haftar, who served as a military officer under Gaddafi before defecting in the 1980s, has presented himself as a strong leader who can unify the country. He has spent the last few years battling extremist groups and other rivals in eastern Libya with aid from the United Arab Emirates, Egypt, Russia and France. He now controls most of eastern Libya, including the country's main oil facilities, and has recently made inroads across the south. His forces include the remnants of Gaddafi's army as well as tribal fighters and ultra-conservative Islamists known as Salafists. They appear more like a regular army than their adversaries, with uniforms and a clear chain of command. The LNA is allied with other militias from the western city of Zintan that were driven out of Tripoli in 2014. Haftar's forces boast MiG fighter jets supplied by neighboring Egypt, as well as drones, attack helicopters and mine-resistant vehicles. Their heavy weapons and air power give them an advantage in open areas. But they have struggled in urban combat, and their campaigns in the east have left a swath of destruction in Benghazi and other cities. A similar scenario could play out in Tripoli, with local militias luring Haftar's forces into the city and fighting block by block. 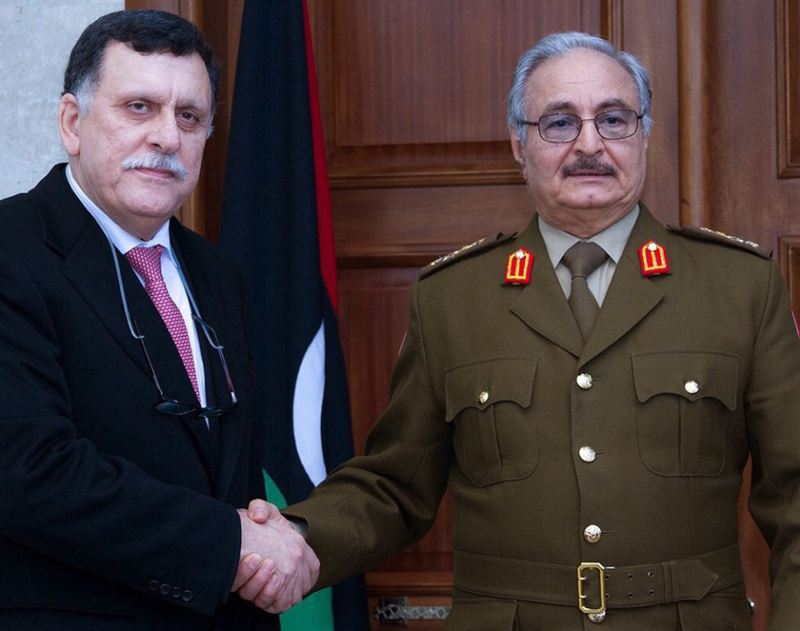 The UN and Western nations support a transitional government set up in Tripoli in 2016 and led by Fayez Sarraj, a technocrat with no military experience. His government was forced to court powerful militias for its own protection, and these groups have vowed to repel Haftar's forces. 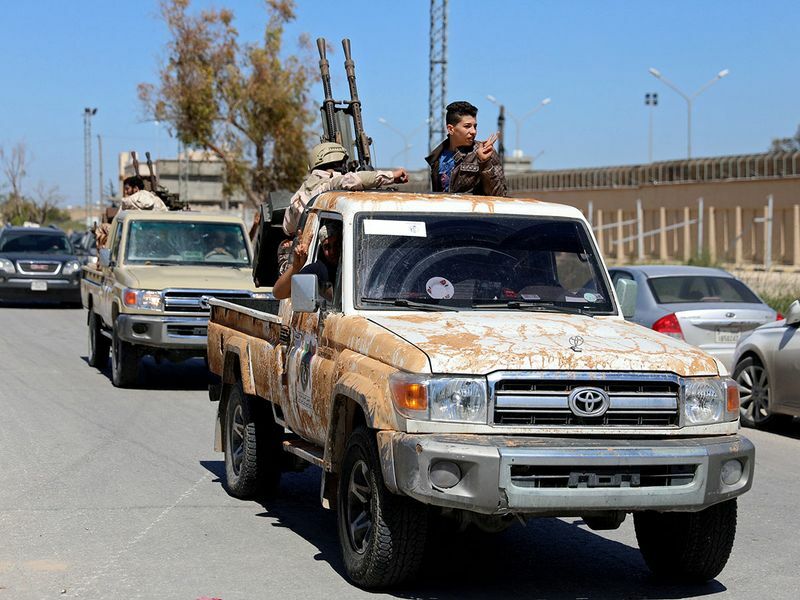 Wolfram Lacher, a Libya expert at the German Institute for International and Security Affairs, says the main Tripoli militias dominate Sarraj's government and have infiltrated its institutions to pillage state resources. In a report published last year, he described them as "criminal networks straddling business, politics and administration." They include the Special Deterrent Force, led by Salafist commander Abdel-Rauf Kara, which controls the entrances to Tripoli as well as Matiga, the capital's only functioning airport. The Nawasi Brigade, led by Salafist Mustafa Qadro, controls the naval base that houses Sarraj's government. The Tripoli Revolutionaries Brigade is led by Haitham Al Tajuri, who was a bus driver before the 2011 uprising but now tools around the capital in a white Mercedes SUV, sporting clothes by Versace and Dolce & Gabbana. His forces control much of Tripoli, including the southern outskirts. A UN report in 2016 said Al Tajuri and his associates had threatened Central Bank employees in order to receive letters of credit worth more than $20 million. His group was also behind the brief kidnapping of a former prime minister in 2017. The Misrata militias secured US military support for their campaign against the Daesh group in 2016, eventually driving the extremists from their main stronghold in the central city of Sirte. The Misratans also have a large number of tanks they captured from Gadhafi's forces in 2011. Zawiya is home to the Martyrs of Victory Brigade, another powerful militia that has joined the alliance against Haftar. Militiamen from Zawiya captured 100 of Haftar's fighters the day after he launched his offensive. The leader of the Martyrs of Victory Brigade, Mahmoud Kachlaf, is under U.N. sanctions for allegedly running a large migrant smuggling network. He is accused of working with the commander of the Libyan coast guard in Zawiya to intercept boats run by rival smuggling networks and then detain, abuse and exploit migrants. A loose alliance of militias, including some affiliated with the Muslim Brotherhood group, seized Tripoli in 2014 after their rivals won disputed parliamentary elections. The new parliament relocated to eastern Libya and later allied itself with Haftar, resulting in competing governments. He is under UN and US sanctions for repeatedly attacking forces allied with Sarraj's government, most recently last August. But for now, he is siding with them against Haftar. After 2011, Libya emerged as a major conduit for refugees and migrants fleeing war and poverty in Africa for a better life in Europe. Thousands of migrants have perished while trying to cross the Mediterranean in overcrowded boats while others have been detained and abused by smugglers and armed groups. The European Union has provided aid to Sarraj's government to help stem the flow of migrants, and Italy has provided vessels and training to the Libyan coast guard. 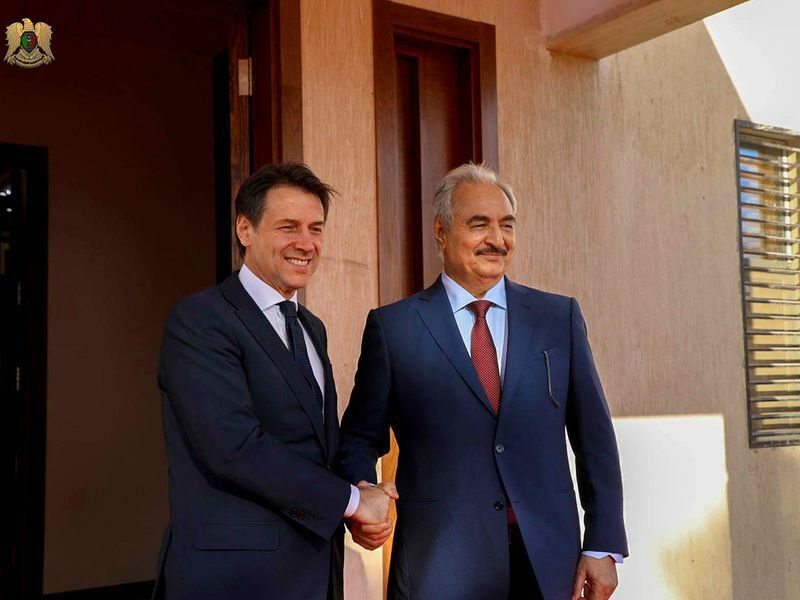 The Associated Press reported in 2017 that Italy had reached an agreement with the UN-backed government to pay militias implicated in trafficking to prevent migrants from departing from the port city of Sabratha. Security officials at the time warned that the groups would use the aid to buy arms and recruit fighters.